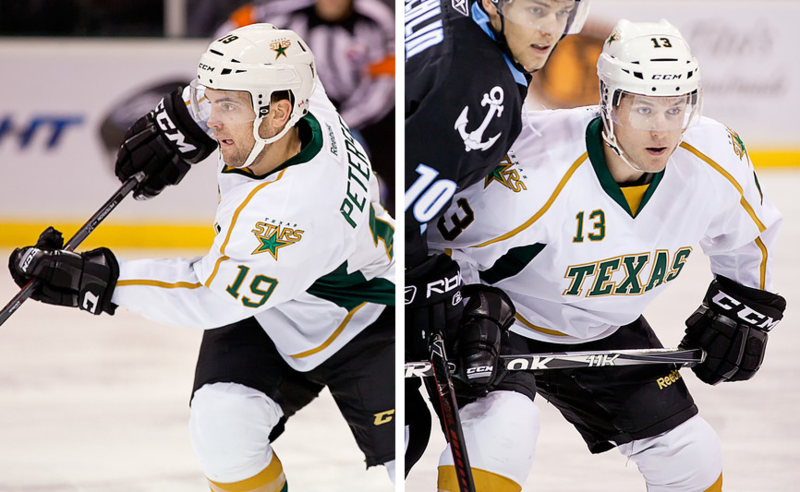 While many sports teams are focusing on Movember campaigns, the month of November has an additional very different and extremely personal meaning to two Texas Stars forwards. This month is also National Diabetes Month. Both seasoned vet, Toby Petersen, and rookie, Taylor Vause, suffer from the disease, which destroys the body's ability to regulate blood sugar. "A lot of people feel that diabetes will hinder your life, that it will stop you from doing what you want to do. That was my worry," said Vause. "You can go out and have fun with life, play sports, do good in school and live a healthy life with diabetes." Both Vause and Petersen have to work to continually monitor their blood sugar during the day but also during Stars practices and games. "Every morning when I wake up, it's the first thing I think of," says Toby Petersen. "Where's my blood sugar? What food do I need?" "You're always trying to keep it in range," said Vause. "I test after the pregame meeting, before warmup, after warmup, between each period and after the game as well." The main message that both want to impart is that you can live a normal life with diabetes. Petersen and Vause were diagnosed at completely different stages of their lives, which is actually typical of type 1 diabetes. Currently, adult-onset cases of type 1 are actually two to three times more common than juvenile onset. For Petersen, it started with a cross-country ski trip at age five. "I just couldn't make it out the door. My mom grew up with it because her sister had it. She knew the symptoms." Vause had similar issues but encountered them far later in life. In his first year with the Swift Current Broncos, nothing seemed to be going his way. "I was really tired all the time. We attributed it to the new league at first. New league, new home, and dealing with a lot." But it wasn't the new home. Taylor returned after Christmas and experienced a new symptom that made him visit the doctor: dry mouth. "I went to the doctor because my mouth was so dry. It was incomprehensible how much I was drinking. I told my trainer that something was up. I lost ten pounds as well." Taylor's symptoms, weight loss, fatigue and dry mouth, are all classic sign of diabetes, along with frequent urination and increased hunger. The young Petersen was already skating at five and wanted to get back the ice with his mite teammates. "I remember the nurses joking with me about being the big hockey player. The doctors were stressing that we'll get this under control and back on the ice with your mite buddies." Vause received a few calls after his diagnosis, most notably from NHLers Bobby Clarke and Nick Boynton, who encouraged him that he could live a normal live and play hockey with the disease. Despite the playing experience differential between the two players, they trade tricks and tips for managing their blood sugar, sometimes finding new methods and other times not. "We've been sharing ideas," said Petersen. "Everyone's different. Taylor wears his insulin pump in practice; I wear it in games, too. It's great to have him on the team. It's so rare to have one person on the team who is diabetic, so having two is a nice treat." "To have Toby as a mentor, it's been great moving up to pro," added Vause. "We feed off each other where we've got tricks that work for us and see if they work for the other person." The two recently headed out to local elementary schools to spread awareness of the disease. Vause won the WHL Humanitarian of the Year Award for his work with diabetes awareness campaigns. Petersen has been an active participant in fundraising and awareness campaigns for JDRF (Juvenile Diabetes Research Foundation) since 1999, when he was at Colorado College. The JDRF recognized Petersen as a Celebrity Ambassador Spokesperson for the Dallas area during his time as a Dallas Star. During his last stint in the AHL, Petersen was the Iowa Stars' Humanitarian Award winner. He and his wife, Alexa, are now the player representatives to the Texas Stars Foundation. "I'm very excited about raising awareness for diabetes," said Petersen. "People have it under control better than 40 years ago, but it still has dire consequences. Times have changed and things have improved but research is still needed." The JDRF national website can be found at jdrf.org. The Austin chapter can be found at jdrf.org/austin. My sister got Type 1 at age 18. It was pretty scary at first. Now she's 42 years old and thanks to an insulin pump has a successful pregnancy under her belt, which was unthinkable even 20 years ago. I remember back in the 60s one of our neighbors was diagnosed as a toddler and was given a life expectancy of no more than age 15. My hope is still that they'll find a cure for it, but treatment today is amazing. Good for the boys for coping so well with it and not letting it stop their dreams!